From the rear view, the BMW 550i captures speed and incorporates velocity in the sweeping curves of its taillights and the muscley bodylines. Twin chrome plated exhaust pipes hint at what lies lurking underneath the hood. Grace and pace go hand in hand with this mile eater. With seven-spoke alloys and massive 245/40 R18 alloys, the trim and athletic looking BMW 550i portrays speed from every angle. With the practicality of four doors in the sedan version and five doors in the wagon version, the BMW 550i boasts adequate comfort and space along with rapid transportation. Split folding rear seats make it possible to carry those longer luggage items such as a pair of skis with ease. I think this would be preferable to spoiling the flowing roofline with a roof rack. Inside the snug and comfy cabin, the BMW 550i boasts levels of comfort that exist for those who aspire to owning only the very best. So, only leather will suffice for a car of such beauty and presence – exclusive Nappa leather being the premium upholstery option in either black or tobacco colouring. Add to this a premium CD sound system and a dual zone automatic air conditioning unit, and you have blissful pleasure normally associated with certain other enjoyments in life. Casting your eyes over the tastefully crafted instrument panel you will see sitting in the centre of the dash a 6.5″ monitor display, and lower down is the iDrive controller. The BMW 550i has an onboard computer to keep you right up to date with the journey’s progress. Information is also given on how the car is covering the distance. Also an outside temperature display reveals just how cold the outside air temperature is, before you venture out of the homely cabin on your destination arrival. For those who like to bring some extra electronic entertainment toys with them on the journey the BMW 550i has two 12 volt power sockets situated in the rear of the front centre console to power them. The BMW 550i has only the best on offer for safety features, ensuring that all occupants are as secure as is possible if the worst happens. Electronic braking items are leading edge and help aid the car’s balance and already colossal grip levels in all driving conditions. 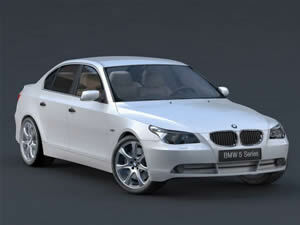 The BMW 550i has an electronically limited top speed of 250 km/h. And if you care to take the BMW 550i flat out – where permissible – then the 4.8 V8 engine responds with power that will send you squeezing back into the leather seats under full throttle. Acceleration like this delights one’s soul. The V8 has loads of power on demand, and it is effortless in its response. With a 0-100 km/h time of 5.3 seconds there will be no need to be late for the board meetings. Goodness only knows what she would do if the restriction was removed! For any more information on the BMW 550i, or for that matter any other new car, contact one of our friendly consultants on 1300 303 181. If you’d like some fleet discount pricing (yes even for private buyers! ), we can submit vehicle quote requests out to our national network of BMW dealers and come back with pricing within 24 hours. Private Fleet – car buying made easy!